Hello to all my wonderful friends. Today, I want to share with you a very special book I had the pleasure of reviewing for Melissa Stramel. Melissa, from Lilac Lane, contacted me a while ago and asked if I would be part of a book tour for her new book...A Year of Making Life Beautiful. Absolutely!! When the book arrived I was over joyed with how beautiful it was. As I read further, the word "beautiful" is the theme for everything Melissa does...from sewing, quilting, crafting, cooking to gardening. 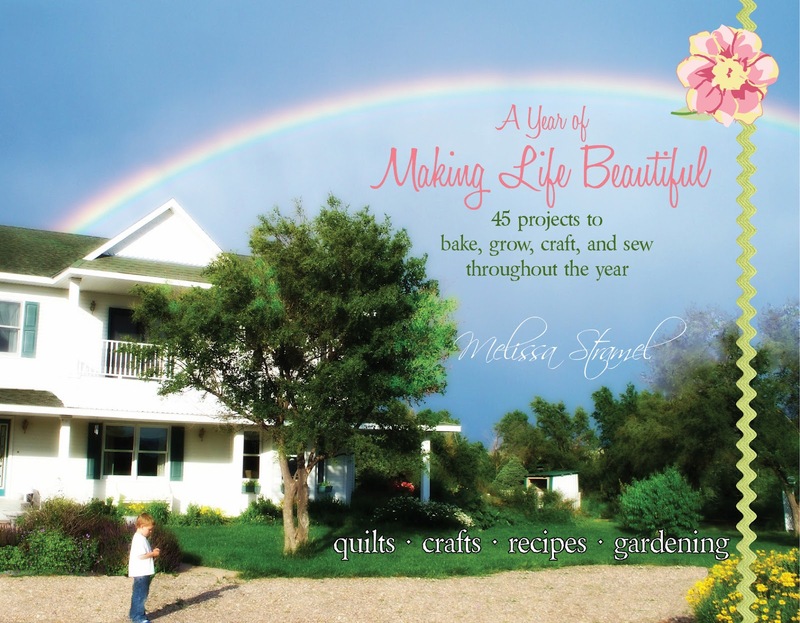 As it says on the cover, Melissa has 45 projects to bake, grow, craft and sew throughout the year...and does she ever. 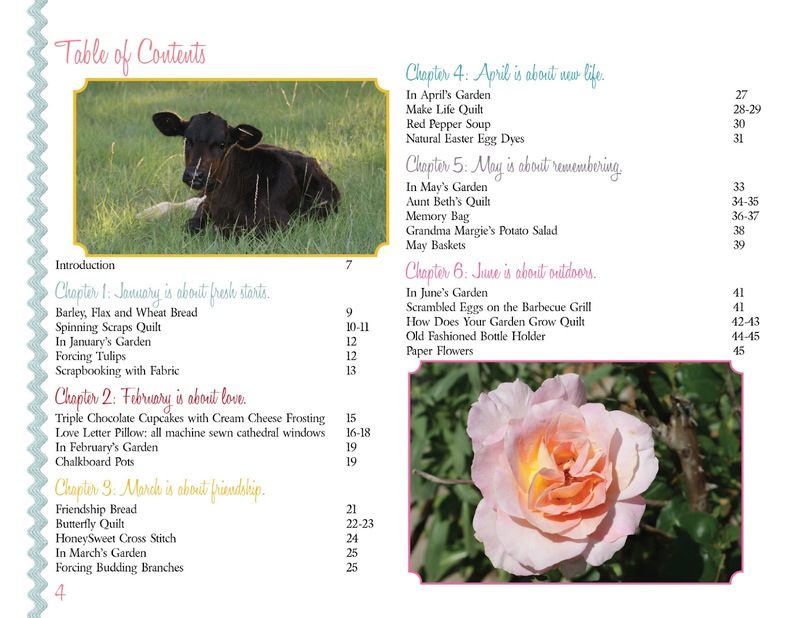 Just look at the table of contents. Amazing!! The book, which is available in soft and hard cover, is just chock full of ideas. It is set up by the months of the calendar. 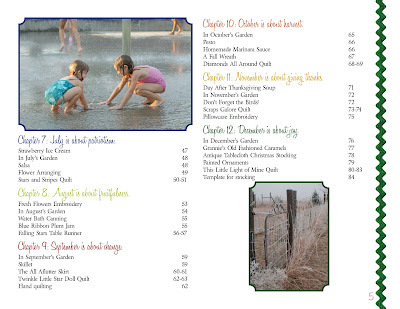 Each month has beautiful pictures of projects, fabulous recipes and gardening tips. Melissa not only shares her creations, she also share her wonderful family. I just love the personal touch her family adds to the book. Here are just a few of the projects she shares in the book...Hexagon Christmas stocking. You know I love my hexies!! May Baskets. Perfect little treat for friends and neighbors! and the Quilts. 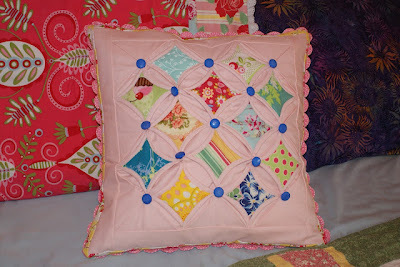 We can't forget the quilts...each one better than the next!! This Cathedral Quilt Pillow is at the top of my "To Do" list. I've always wanted to make a Cathedral quilt like the one my grandmother made years and years ago, but a large quilt always seems so daunting. This pillow is just what I need. Small and Do-able!! Ok...I've shared enough. You have to see how beautiful it is for yourself. There are 2 ways to see Melissa's book...enter my give away or visit Melissa's blog for details to own a book for yourself!. Good luck everyone and thank you Melissa for sharing your talents with us. Here is the schedule for the rest of the book tour...stop by for a visit. My favorite month of the year is October! Not too hot, not too cold, Halloween, Halloween treats!!! I think May is a good month, Karen! Usually perfect weather. Lots of flowers, etc., etc. Favorite month has to be December. I just love Christmas! My favourite month is October! Fall is my favourite season, and the fall colours here in October are stunning. Our Thanksgiving is in October, so it's a time for family, fun & food. But the best part of October? My wedding anniversary starts the month. 35 years married to my soul mate this year! (And "they" said it'd never last---HA!) Thanks for the chance to win. My favorite month is always April...it's my birthday month:) thanks for the bautiful book giveaway! My favorite month would be June because that when we have our big week long family reunion at a lake. Nothing beats sitting around a campfire with 70-80 of four generations of family members!! The book looks interesting. It would be easier to say my LEAST favorite month which would be January because typically its our couldest month. Based on that, August would be my favorite because it typically is our hottest. Please enter me in your giveaway. I'd like to see what could make my January's more likable. Every month has it's positives so I will choose August, my birthday month and the end of winter here in Australia. Thanks for the great giveaway Karen. I love May and May baskets. 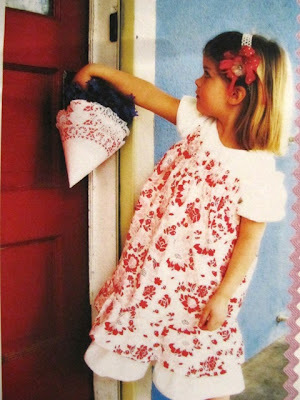 When I was growing up we would make them and sneak them over to a neighbors porch step, ring the bell and run! It's really the start of Spring here, planting and growing. Such a wonderful month after winter. I love December and the Christmas season. This book looks like fun. Thanks for the chance to win a copy! My favorite month would have to be October. I'm not at all a fan of summer and hot weather and bugs. Even though October can still gets in the 70's and sometimes 80's, I know it won't last for long. Then it's the beginning of the holiday season and refreshing cool/cold air! The book looks just gorgeous. Thank you for the chance to win a copy! This book looks awesome! Love the variety of projects. It's hard to choose a favorite month, but I think May brings out the beauty of flowers blooming and warmer days ahead. My favorite month is November. Firstly because it is my birthday month, my sister's birthday month and my twin's birthday month. It is also the end of hurricaine season, and the beginning of the Holiday season. I love Fall and all the colors (not so much here in the South) and the cleanness of the air as it turns crisp. Yea, November. My favorite month is July. It's my birthday month, and we go to our favorite state park and swim, have fried chicken and birthday cake. It's something special that I look forward to each year. Looks like a wonderful book! My favorite month is February when things are quiet and cold. October is a great time. Beautiful colors. Harvest. Cool nights. Hmm...what could I sew up to make it even nicer? What a beautiful book! My favorite month is July. We celebrate our anniversary with fireworks on the 4th :) and we usually get to the beach. Thank you for the give~away! My favorite month is June. School is out, my son's birthday is here, and it is summer!! February has to be all in red in her book. Besides that's my birthday month. I'd love to win a copy! Thought you might like this youtube link, showing a 10 minute quilt block which is a cathedral block. Enjoy! Oh, and my favorite month is....December! January is my favorite month because it is full of potential. It is also my favorite month for crafting! It is usually quiet, I have Christmas gifts to play with and since I always try to start the year more organized, I can usually find what I am looking for! June is a BEAUTIFUL month....You can play in the yard, go on picnics, get the garden planted, leave the windows open...I love summer! ;My favorite month is September - fall is arriving and the leaves are turning - such a beautiful time of the year - plus it just happens to be my birthday month and my birthday falls on the first day of autumn - perfect! What a great giveaway. My favorite month is April. Normally perfect weather, beginning of spring and everything starts to bloom. I'd love to win this book. Thanks for the giveaway. My favorite month is October...I love fall and I love that it's just on the edge of the upcoming holiday craziness. I can enjoy the season with that tiny bit of anticipation for the upcoming fun! The best!!! It is a beautiful book. May is my favorite month. I love September. Perfect camping weather in the Midwest. What a great format for such a book. It looks absolutely lovely. I have a couple books set up like this and truly, they are favorites. I really cannot choose one special month. Each is special for certain reasons but I lean to the Spring (new beginnings) and Fall (nesting) months. I like Winter (only for the opportunity for great photo's, not the cold, dreary stuff) and Summer (because the light is divine.) This is what it is like for me since I can't seem to make a decision anymore! I love September. The warm summer days and the crisp, cool nights are perfect to spend harvesting the vegetable in the garden and preserving them for the winter. My favorite month is October. It's still warm but the humidity is gone and the evenings are cool enough to sit around the fire pit with a cup of hot cider. (A local orchard makes the best apple cider!) The fall colors here are breathtaking and let's not forget Halloween! I can't decide which month is my favorite because there is something fun and unique about every month. So I am putting my name in for the book drawing and saying I love every month and I LOVE your blog. Thanks for sharing. What a BEAUTIFUL book! I have many favorite months, so it's hard to pick just one, but if I had to I'd pick November because of all the beautiful weather and gorgeous colors it brings! I would love to read this book, so an opportunity like this is greatly appreciated! May all your writings be HUGE, BEAUTIFUL successes! I love to make each month special because we just never know how much time we have with those we love! This book looks wonderful, I can't wait to get my hands on it. My special month is August, my birthday month. Definitely June would be the month I would pic! I'm a teacher but have my summers off, so June is the time for me! Thanks for the give-away! 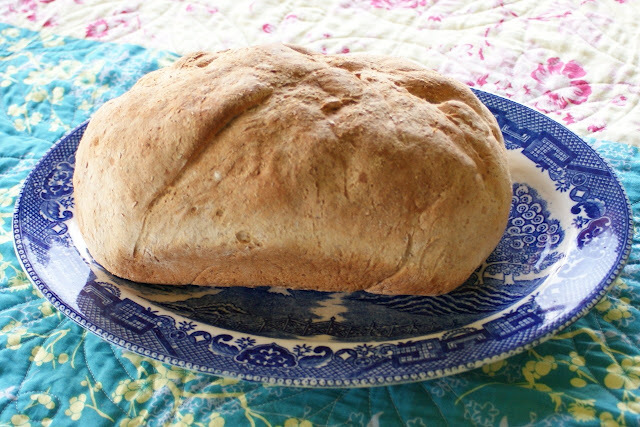 October is my favorite month to get back to home cooking & crafting big-time. I don't have a favorite month, but I love getting ready for Christmas. What a wonderful book! Thank you for sharing. My favorite month is May; I love it when everything starts growing and blooming, turning green. Beautiful book, I'd love to win it. My favorite month is October- the month my children were born!! 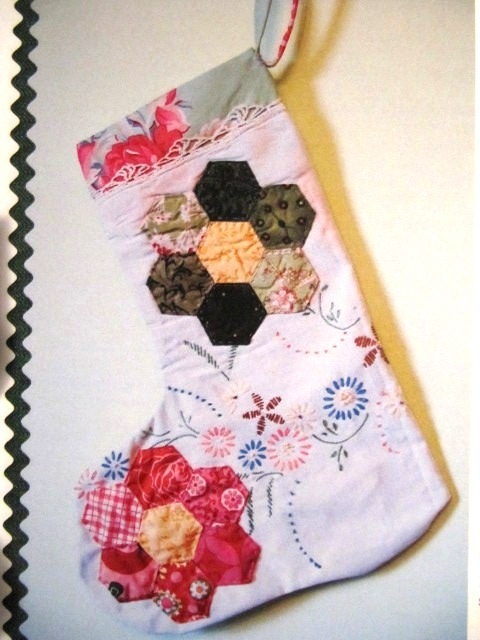 love that hexie stocking too. my favorite month is October because by then cooler weather is coming and by then I am so tired of the heat and humidity of summertime. My favorite month to honor the theme would be ALL of them!! Each month is beautiful in its own way! my favorite month of the year is October...love the colours and the not too hot, not too cold weather...also allergy season is finally over!! My favorite month is October. The fall weather is beautiful and the colors are changing. We have lots of family birthdays in October as well. I love the pillow! I want to make one too! Oops! I forgot to say my fav month...it's so hard to pick just 1! I guess I'd have to say it's December...the month we celebrate the birth of our Lord and Saviour. My favorite month is February. For some reason in my life, the best and most lasting things have happened in that month, including a career that started (now I am 30 years at same place), started dating my now husband ( of 28 years) and it is also a time for romantic dates and crafts and decorating the house with everything that is Valentine's Dayish! My favorite month is October, since I love decorating for fall and Halloween. Gosh, I don't know that I have a favorite month. Maybe it is May- all the things popping out in the garden and my anniversary. Looks like a great book. November is for giving thanks...that is my favorite month I think. Thanks for the opportunity to win! I love, love her blog and her book!! My favorite month is probably February - the stress of the holidays are over and it's all about the LOVE! My favorite month is July. I love the fireworks, parades, family cookouts, and ball games. I am also decorating my front porch in red, white, and blue. It will be a year long reminder of where I am and what this great nation has done for me. Being married to a vet, I like to pay tribute to everyone that has made the sacrifices for us today. My favorite month is April. April has so many signs of life returning in the flowers, trees and plants. It's also the month when we celebrate Easter the greatest time of life returning. 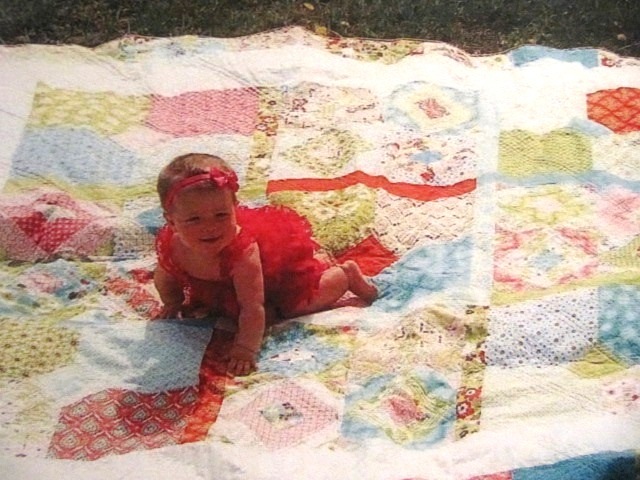 The weather get warmer during the day but you still need a wonderful quilt to snuggle up in at night. My favorite month is October, because my favorite holiday is Halloween. I love the costumes and gayety that comes out on that day. And, it is at the end of harvest, yum! I guess February, since it is my birth month. I'd love to check out those triple chocolate cupcakes she listed. Yum! You got me at the title! I like the idea of the range of projects it offers, all the things that are of interest to me. Favourite month has to be May, all the lovely blossom, spring flowers and fresh green foliage beginning to emerge. My favorite month would have to be October. Yes, it is my birthday month but also my triplets were born in October. I love the fall season, the colors, the smells and the cool air. Thanks for the great giveaway. My favorite month is April because that's when the cherry blossoms come out. I love all months for different reasons but my favorite month is July! It is my birthday month. And my kids are out of school so we can sleep late. And we cook outside and sit on the patio and sing while my hubby plays guitar. Lovely! I would love to win a copy. This book looks like "sew" much fun! My favorite month is probably October. I love breaking out the Halloween decorations to kick off the holiday season. 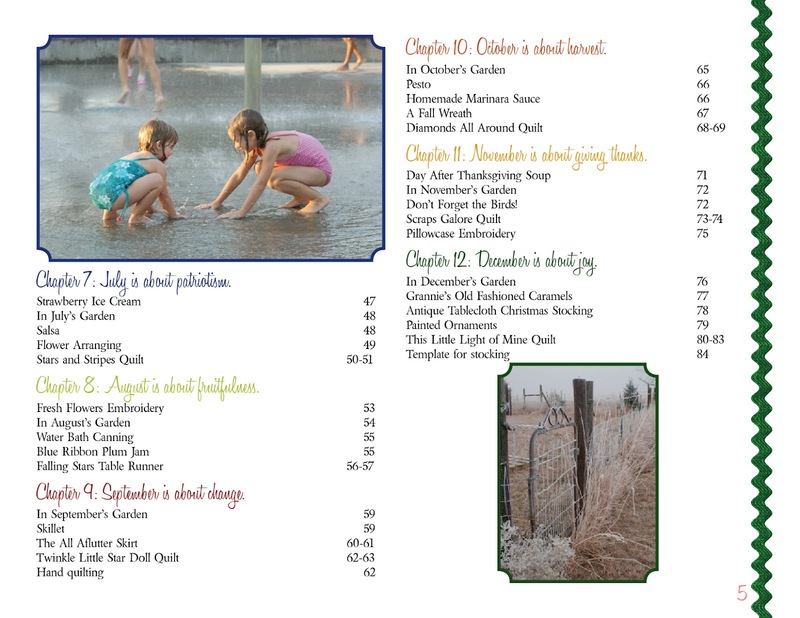 There is also a chill in the air here in Colorado and I get back into quilting during that time. A nice pumpkin spice candle burning really tops it off. Looks like lots of inspiration for years to come. I'd love to win. Thanks. Gosh I don't really have a favorite month but if I have to choose I'll say April because thats the month my first grandchild was born! The book looks awesome and I would love to win it! I think I would have to pick November. That is when the weather starts to turn fall-like and there is a nip in the air blowing the leaves around. Love it! I think my favorite month has to be april. I LOVE spring and all of the beautiful flowers bloom. This sounds like a wonderful book! I'd love to be the winner. I think I would enjoy it throughout the year. I have to say October, I love the weather, and all of the upcoming holidays, starting with Halloween. April and May are springtime months here in south central Texas and they are my favorite months. Lot's of beautiful wildfloweres, if we get rain like we did this year. Looks like a wonderful book that would insprire me every month. Thanks for sharing. Melissa's book looks amazing! My favourite month of the year would be september - our springtime in the southern hemisphere. Living in Florida I think my favorite month is November, because that is when the weather is practically perfect! I say December because I LOVE all things Christmas!! My favourite month is May. Where I live, it is usually a month where we do not need the air conditioning or the furnace, and can just open the windows and enjoy! I love October! Fall is my favorite season so it's the best month for cool weather here and not much rain. Hmmm wish the question was favorite season, I'd say fall. hehe. So I'll say November as family and friends are close, lots of food and being together. Melissa's book sounds amazing. This looks like a wonderful book! I love May when the garden is starting to bloom. I love April. Spring is showing, and it's my birthday month! I think this book looks like it will be wonderful. November is my favorite month ~ chilly in Denver, but not too cold, the mountains frosted in snow, cozy evenings w/my family, preparing for the upcoming holidays, and enjoying Thanksgiving. Oh, my goodness! I can hardly believe that I am the 99th person to find and comment on your wonderful giveaway! June 20th is my birthday...and, oh, how sweet it would be to win your giveaway! What a delightful book! Thankyou for sharing your great post and for choosing to bless one of your blogging friends! OOps...I forgot to shaer my favorite month of the year! It's difficult for me to decide, but, I'd say it is June. I love the introduction of red, white and blue...strawberries, cherries...Yes, June it is! March is a beautiful month for me. My huge azalea bush is in bloom! Thanks for the review of Melissa's book and for the giveaway. My favorite month of the year is May - it's the month I plant my garden and plan summer vacation. I love the month of July. It is everything Red White & Blue. Patriotism runs through my veins, I guess because July is also my birthday month. Cannot wait for the Olympics to start in July. God Bless the USA. Thanks for doing this great giveaway. My favorite month is October, the rush of September back to school is over and we can sit back and enjoy fall. Melissa's book looks fabulous. so hard to say, I guess November when it starts to cool off in Central Texas! thanks for the chance to win! I love April. The trees are budding and the air smells so sweet. What a beautiful book - I would love to win it. My favorite is May - a beautiful month here. My favorite month is December! I love making things all year to give at Christmas! This book would help me out so much, I could use it to make presents! Thanks for the giveaway. It is difficult to choose a favorite month; but since I have to, I choose January. January we usually hove the coldest weather so there are not chores to do in the yard and I can sew all day long and not feel guilty. Thanks for sharing this wonderful book. My favorite month is May, my bday month. Thanks for the chance to win! My favorite month is October. It is our last hoorah before winter sets in. The smell of squash baking along with a roast on a fall afternoon along with apple pie with ice cream is about the best kind of day I can imagine. I enjoy the fall months, probably October the most. The colors, the crisp air, cuddling into a blanket and reading a book. What a lovely book! I love the fall, particularly October, with the fall colors and pumpkins. I was married in October 35 years ago! I love fall when everything is crisp and sharp. Everything has such a wonderful smell. Can you imagine what life would be if you never smelled burning leaves, had a bonfire, roasting marshmallows with someone you love, hay rides with warm quilts to keep your warm. February is birthday month so lots to celebrate, but June and October are favorites, too. I would love to win copy of the book. So many interesting projects to try! My favorite time would be fall... cool crisp days, brightly colored leaves.. best time of year for walking... not to hot or too cold! Summer works for me. I have time to enjoy "beauty" all around - all the "beautiful colors of summer and so like to relax with a good book. This book looks so beautiful and useful. It would certainly make a lovely gift. I love the long days of June! My favorite month is September because the weather is still beautiful, but fall is right around the corner. October is my favorite month! I love the season change and cooler weather and its my moms and my birthday month! June is my Favorite Month. My daughter's birthday and Summer begins, which is the perfect time for new Projects! My favorite month of the year is November. I love Thanksgiving Day and preparing for that holiday. 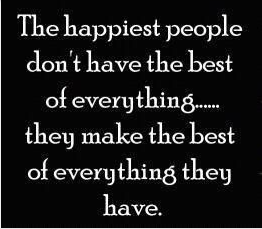 There is so much to be thankful for! Love June because it is not too hot and not too cold. Just right to enjoy the outdoors everyday! Picking a favorite month is so hard! I am going to go with July. I love summer and sun Here in Seattle for the most part July is the hottest time we get here all year.